Romy Gill is the owner and head chef at Romy’s Kitchen, Restaurant which opened in September 2013 on Castle Street, Thornbury. 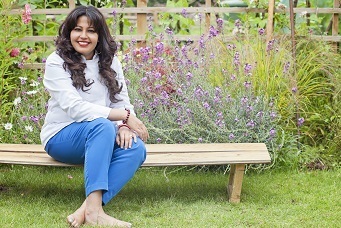 The first ever female Indian chef-owner in the UK, Romy is passionate about health and natural, local ingredients. She uses rapeseed oil in the place of ghee where possible, and avoids the use of unnatural food colourings. Her dishes combine spices and flavours that she grew up with in India with ingredients that she was only introduced to when she moved to the UK: a blend of Indian flavours and ingredients produced locally to her Thornbury restaurant. Passionate about good health, she has lost a great deal of weight since the birth of her daughters, helped by her commitment to producing healthier Indian food and her love of running. Romy has now competed in around 20 half marathons, 2 marathons New York and Berlin and doing the Mumbai Marathon in Jan 2015. Romy also demonstrates her cooking at festivals both in the UK and abroad, including the Foodies Festival, Grand Designs exhibitions and at food and cultural festivals in Abu Dhabi, New York and other locations. She cooked at a charity event hosted by Atul Kochhar in late 2013, and in May 2014, was heavily involved with the Bristol Food Connections festival: a citywide celebration of local food and drink. Along with other top chefs such as Martin Blunos,Tom Kerridge and Ken Hom, Romy took to the BBC Stars’ Kitchen to give live demos of some of her popular recipes. During the Bristol Food Connections festival, Romy was also a guest on Saturday Live, alongside Jay Rayner and others. Examples of Romy’s recipes can be seen on the BBC website at http://www.bbc.co.uk/food/chefs/romy_gill.